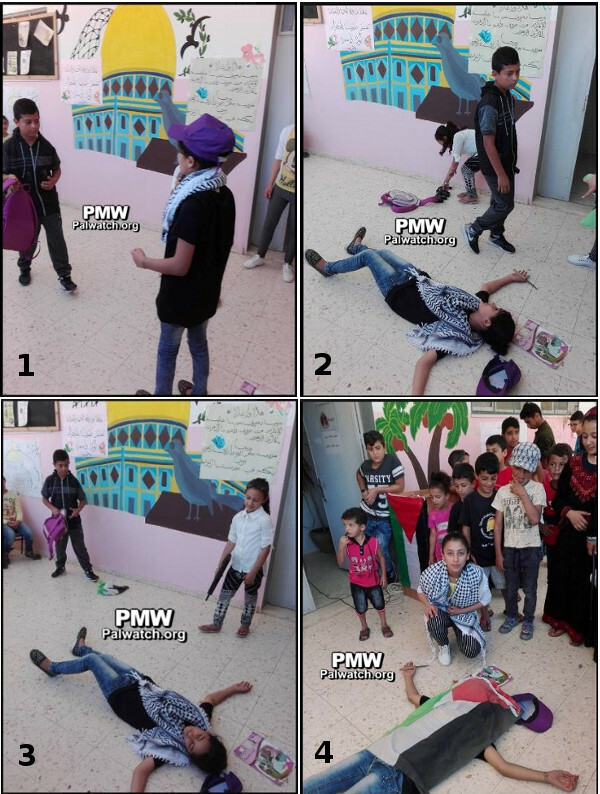 Kids' plays show terrorist stabbers being shot by "Israelis" and dying as "Martyrs"
Many Palestinian children participated this summer in camps that promoted hate, terror, Martyrdom-death and denial of the existence of Israel. The camps were organized by the PLO Supreme Council for Sport and Youth Affairs and the PA's National Committee for Summer Camps, both of which are funded by the PA Budget. On its Facebook page, the National Committee for Summer Camps has listed itself as a "governmental organization." In Arabic it defines itself as "a governmental institution for children aged 6-12 years with recreational activities aimed to develop the Palestinian child in various fields." Among the "partners and supporters," listed on the website of the PA's National Committee for Summer Camps, are UNICEF and UNDP (accessed Aug. 30, 2017). 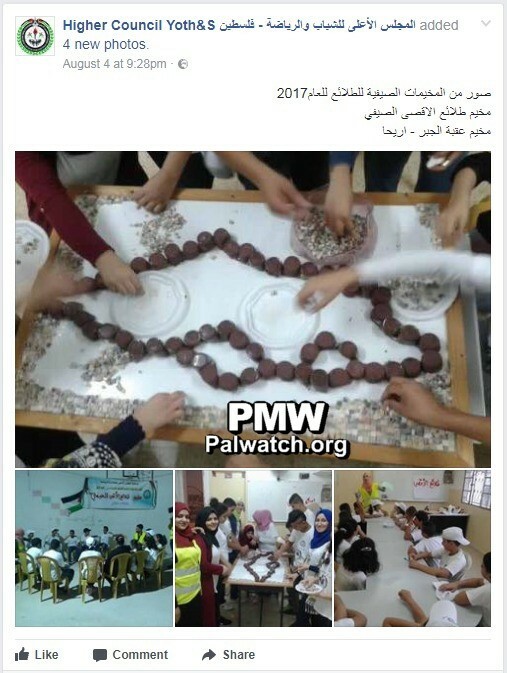 The PA's summer camp messages to children included glorifying terror, venerating Martyrdom-death, and picturing a world without Israel in which all Israel has become "Palestine." Camp activities included children performing plays in which the children depicted Palestinian stabbers carrying out terror attacks and being shot and killed by "Israelis," and dying as honored "Martyrs." 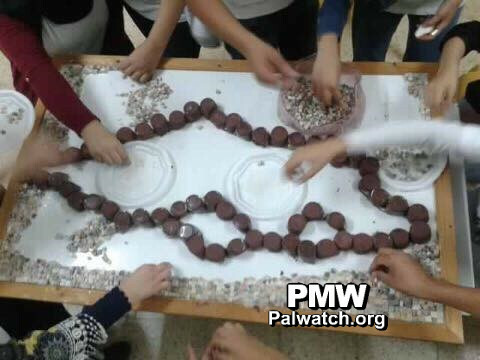 Children created sculptures and drawings of the map of "Palestine," which includes all of Israel in addition to the PA areas, encouraging children to disregard the existence of Israel and foresee a world without it. Children were taught that Palestine's border to the north is Lebanon and to the south is the Gulf of Aqaba, again depicting a world in which "Palestine" has replaced Israel. At a camp organized by the PA-funded National Committee for Summer Camps, children performed a mock stabbing terror attack at the closing ceremony of the camp. The first photo shows a girl wearing an Arab headdress and playing the part of a terrorist, as she faces off against a boy playing an Israeli. The second and third photos show the Palestinian girl "dead" on the ground with a knife in her hand after the "Israelis" who "shot" her standing next to her. The fourth photo shows a number of children standing behind the terrorist "Martyr" lying on the ground with a Palestinian flag draped over her, as is common practice at the funeral of "Martyrs." 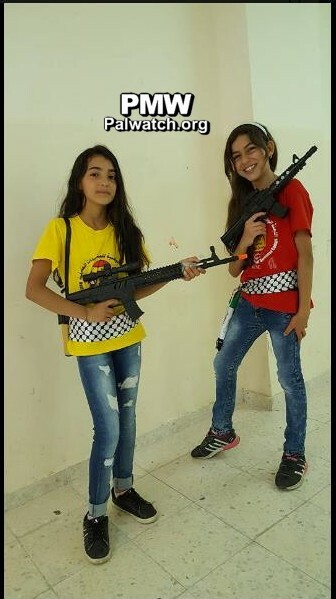 One photo shows two girls posing with toy assault rifles (below right), while another shows a scene from a children's play enacting a stabbing attack (below left). Three girls are wearing Israeli flags on their shirts, playing the role of Israelis. One is lying on the floor, presumably after being stabbed, while the other two are aiming toy assault rifles at two Palestinians wearing Palestinian flags on their shirts and who are lying "dead" as "Martyrs" on the ground with knives in their hands, "killed" by the Israelis. "With the approach of the conclusion of the summer camps and the preparations for the central closing ceremony that the [PLO] Supreme Council for Sport and Youth Affairs will hold in Ramallah, the activities are continuing... in the Jericho district in 11 camps, including... the summer camp organized by the Ein Al-Sultan Center, whose groups are named after Martyr leaders Yasser Arafat, Ghassan Kanafani (i.e., a PFLP terror leader), Dalal Mughrabi (i.e., terrorist who led murder of 37, 12 of them children), Khalil Al-Wazir (i.e., terrorist responsible for attacks in which 125 Israelis were murdered), and Laila Khaled (i.e., PFLP terrorist and plane hijacker)." A summer camp held by Abbas' Fatah Movement also taught children to see murderers as their role models. Earlier this month, Palestinian Media Watch reported that Fatah named a summer camp after terrorist murderer Dalal Mughrabi. 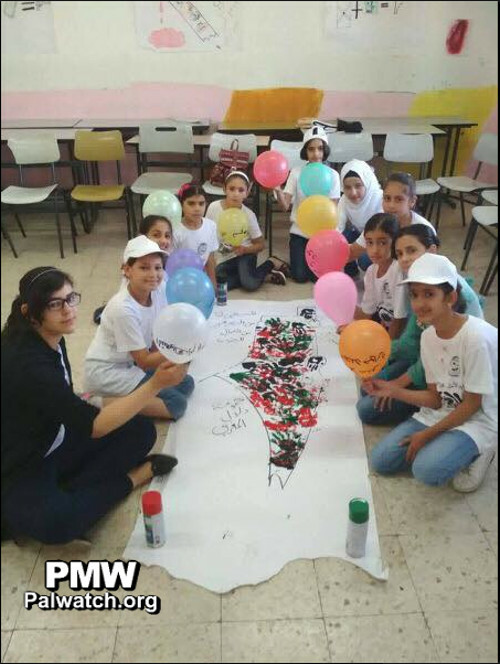 At one camp organized by the National Committee for Summer Camps, children built a large sculpture in the shape of the PA's map of "Palestine" which erases the existence of Israel. The sculpture was painted in the colors of the Palestinian flag, symbolizing Palestinian political sovereignty over all of Israel in addition to the PA areas. A large key represented the so-called "right of return" of Palestinian refugees to Israel. Posted text: "From raw materials in the surroundings, the boys and girls of hope create the map of the homeland"
The Mediterranean Sea on the west"
Significantly, the text's alternative "facts" reiterate the PA message that Israel doesn't exist or will not exist in the future. The description of "Palestine's" territory as 27,009 square kilometers includes the area of all of Israel in addition to the PA areas. The West Bank and Gaza together are 6,220 square kilometers. The description of "Palestine's" borders is also wrong, as it is Israel that borders Lebanon and the Gulf of Aqaba. Palestinian children are taught by the PA not to recognize Israel's existence. Aqabat Jaber refugee camp - Jericho"
Posted text: "In Jericho, a visit was held at the We Will Advance Together [Summer] Camp...The campers were divided into groups bearing the names of cities from the occupied Palestinian Interior (i.e., Palestinian term for Israel), such as: Haifa, Jaffa, Acre, Tiberias, and Nazareth." 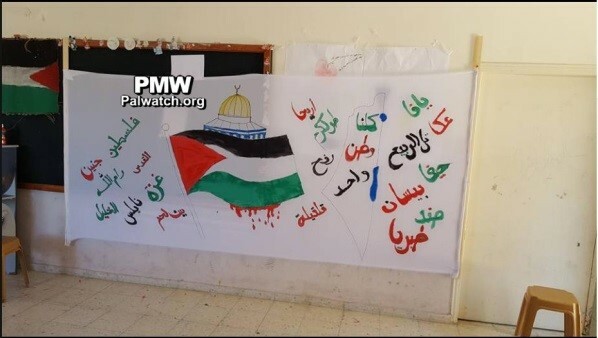 Similarly, a drawing at another camp showed a Palestinian flag dripping with blood with the Dome of the Rock above it and the outline of the PA map of "Palestine" (to the right) that presents all of Israel as "Palestine." To assure that the children received the message that there is no country named Israel, the text on the map states: "We are all a unified homeland." The names of Palestinian cities are written around the map as well as the names of Israeli cities including: "Jaffa," "Acre," "Tal Al-Rabia (i.e., Tel Aviv)," "Haifa," "Beit Shean," and "Tiberias." All of these messages - glorification of terror and terrorists, promotion of Martyrdom-death, and presenting a world in which Israel doesn't exist and/or has no right to exist are fundamental Palestinian Authority messages to Palestinians. These messages are transmitted to Palestinian children in formal education, educational television, cultural events, sports and much more. 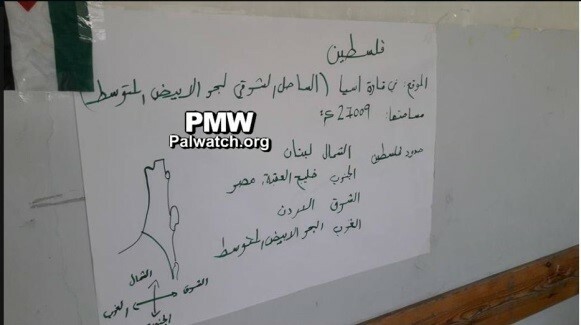 It is therefore not surprising that summer camps, which are funded by the PA are disseminating the same hate messages. 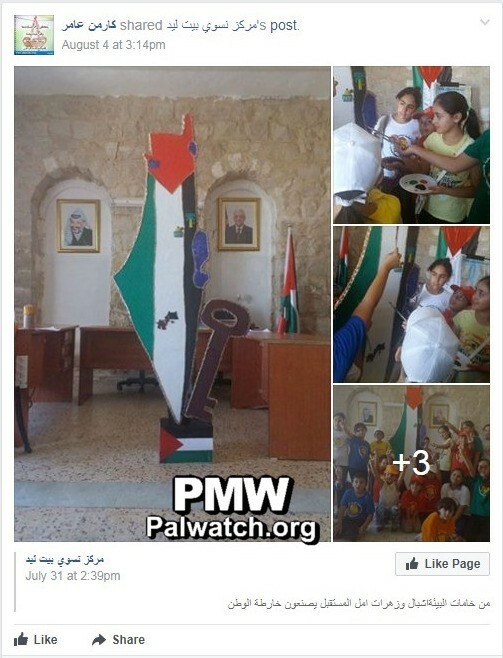 PMW has documented that it is PA policy to educate children to see terrorists and murderers as role models. 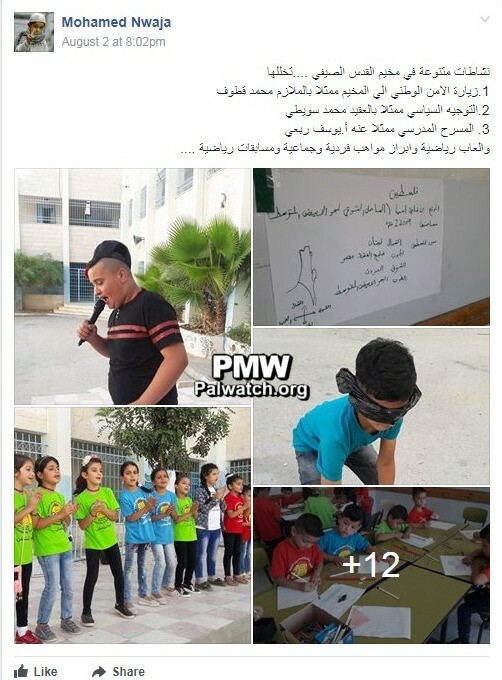 As part of this ideology, the PA Ministry of Education has named at least 30 schools after terrorists, and PMW has shown that the message is effective and youth aspire to "follow the path" of the terrorists. Ghassan Kanafani - a writer and a leader of the terror organization Popular Front for the Liberation of Palestine (PFLP). Laila Khaled - PFLP terrorist who participated in the hijacking of TWA flight 840 from Rome to Athens on Aug. 29, 1969 and the hijacking of El Al flight 219 from Amsterdam to New York on Sept. 6, 1970. The second hijacking was averted by the pilot and security personnel on board. 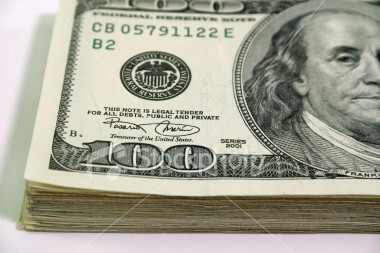 They shot Khaled's accomplice, Patrick Argüello, who had murdered one of the flight attendants. Khaled was overpowered and the plane landed in London, where Khaled was handed over and held by British police until she was exchanged on Oct. 1, 1970 for hostages held by the PFLP.